To many New Englanders (well, really just me), Richmond is known for two things: Coach Shaka Smart of VCU basketball and Civil War history. Now that our son Will and his fiancée Laurel live in nearby Bon Air and work at Virginia Commonwealth University, we can easily fly from Boston to the River City on Delta or JetBlue to experience the South and its warmth. …if you have your good health and if you have enough money. Currently we can check off yes and yes, so we are on the move. Flying Tuesday afternoon from Logan Airport, we arrive two hours later at Richmond International Airport. Curbside, Will whisks us off to the Stuart Siegel Center for tonight’s 6P game, VCU v Toledo University. Arriving a little after five, Will arranges for us to dine at the buffet for the big shots at the Tommy J West club high above the hardwood. Overlooking the court, we feast on sweet potatoes, green beans in mushroom sauce, and tossed salad; honey baked ham is there for the taking for the meat eaters. As we sit in luxury, we think how this club would be a fantastic venue for a rockin’ family party. Shaka Smart has made VCU basketball the “what’s happening” place to be in Richmond on game nights. Tonight will be the 51st straight sell out in this nearly 8000 fan arena. A graduate of Kenyon College in Ohio like my Brother Richard and Uncle Bill, Shaka is named after a Zulu warrior. Always entertaining, his team’s style is to press for 40 minutes and fast break on every possession. With not a bad seat in the house, we sit 15 rows up from the foul line for the tonight’s game televised by ESPN against Toledo, a team that won 27 games last year and returns 7 of its 8 top players. The crowd is electric and plugs into the high paced offense and defense of the VCU Rams. Smart has branded their style of play as “Havoc,” which when rocking, truly befuddles opposing teams. Early on, the game is tight and tense. Last year VCU went undefeated on its home court, but tonight they are meeting their match as the Rockets shoot well and break the press without much trouble. At halftime VCU is lucky to be down only three points, as Toledo shoots 90% from the foul line. “Havoc” defense is meant to eventually wear teams down; and on schedule in the second half, it starts to take its toll on the Rockets. They turn the ball over for an easy two at the rim and three more from downtown. The 87-78 VCU victory reflects the team’s #15 ranking in the country. This close game is all a fan could want: fast-paced action, drama, and ultimately a W.
After a 430A wakeup call this morning in Maine, we sleep well in Virginia after a VCU victory. With a layover day Wednesday before another VCU game Thursday night, Hannah and I plan to take in the Museum of the Confederacy in Richmond. Dropped off in the downtown by Laurel, we easily find it and talk to the museum guide about what lies within. At $13 for seniors, we want multi-media and interactive exhibits. We get neither and decide to invest our $26 of disposable income in another way. Let’s be fair. The museum didn’t really have much of a chance. You wouldn’t call us museum people. We like doing rather than looking. It’s just in our DNA. But not going to the museum today is win/win. The museum is not subjected to our feigned interest and we can walk and hike in Richmond this mid-November day. Just down the hill to the James River, Richmond’s Canal Walk meanders along the shoreline for a mile and a quarter. It’s a winter coat and mittens day here in the South, but our steady pace keeps us warm. Normally in warmer weather the bistros and restaurants along the canal are buzzing while the park on Brown’s Island is filled with families, joggers, and Frisbee players. Soon finding our way to the suspension bridge across the James River to Belle Isle, we enter a network of trails. Belle Isle was first explored by the Captain John Smith in 1607. Later the island served as a prison for 30,000 Union soldiers during the American Civil War. 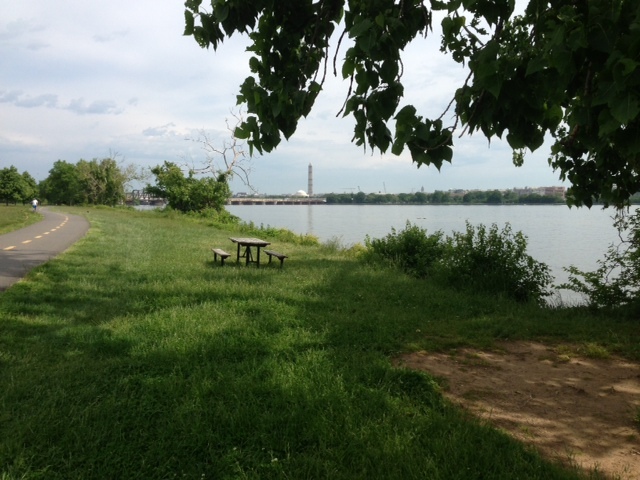 In warmer weather, Belle Isle is a great place for trail walking, swimming and kayaking in the James River, rock jumping, sunbathing, and boulder-top picnicking, just feet away from white water rapids. Another victory for the Rams! Exercise-satisfied, we await Thursday’s VCU game at the Siegel Center. Thursday, the Rams hit their first 8 shots and lead 18-0 over University of Maryland Eastern Shore. With the game well in hand from the outset, Shaka substitutes liberally and gets his freshman some valuable collegiate playing time. Richmond in November is just the antidote for the coming deep freeze in New England. Today is like a big par five. 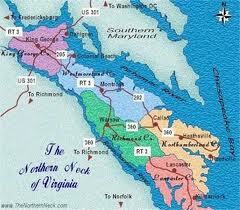 We have one long drive from Richmond (RVA) before we hike. Given that Virginia and North Carolina abut and given that RVA is in the center of Virginia, we still have more than 400 miles of driving to Asheville in far western North Carolina. Knowing what lies ahead, I sleep restlessly and wake Hannah early this mid-October Monday; soon we are on the road heading west on I-64 to I-81 south. Shortly after 9A, three hundred miles into the drive, we stop in the little border town of Abingdon, VA looking for a breakfast diner. Though Denny’s or Cracker Barrel might provide a fine breakfast, we want an experience that we can’t find just anywhere and at a good price. As we fill up for $2.92 per gallon (it’s $2.63 now), a delightful country woman explains in sweet detail how to get to Chick-N-Little at the other end of town. Picture this: a diner with pictures from the 1960s (e.g., Dean Martin) on the wall with frames that you get at the Dollar Store. Just men, maybe fifteen of them, are at tables and the counter in work jeans and old man khakis. For $5.99 Hannah gets a veggie omelet, home fries, and biscuits and gravy! Clearly the sky is not falling at Chick-N-Little. As we drive on to Asheville, I think I am just so clever killing two hiking birds with one trail stone. Let me explain. For a good 150 miles, the Appalachian Trail (AT) straddles the North Carolina/ Tennessee border. Ergo, we have an opportunity to hike a trail that borders both states so we can bag states #12 (NC) and #13 (TN) in our quest to day-hike all 14 AT states. Clearly, I am overly impressed with my delusional brilliance. Falling immediately in love with small town Hot Springs, NC, we learn that it’s named for a natural spring with 100+ degree mineral waters. The town itself is becoming a popular tourist destination for rafting and kayaking on the French Broad River as well as hiking, mountain biking, and backpacking. The AT itself goes right through the center of town on Bridge Street marked with AT diamonds in the sidewalk. To find a twofer trail (NC/TN), we enter the small library where Winnie tells us of a trailhead just north of town. 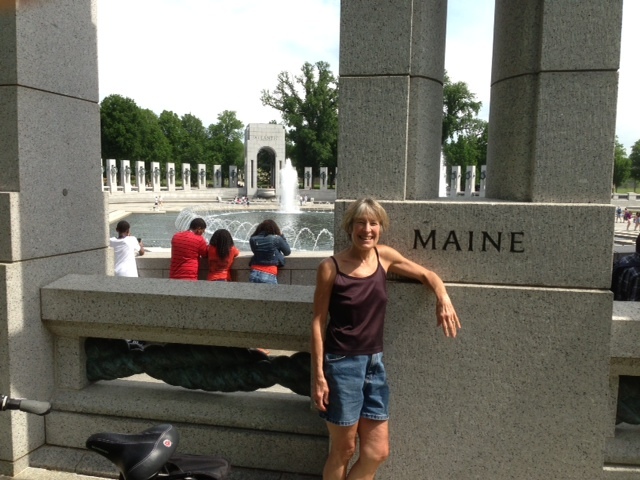 But she says, The Welcome Center knows more about hiking in both states. Babs at the Welcome Center lets us know that she doesn’t think the NC/TN border is close, but the folks down the street at the Bluff Mountain Outfitters will know more. Whipping out a map, they tell us we are ten miles from the nearest NC/TN border. Not having done the necessary research of the AT in NC and TN, I nod and smile and think, que sera sera. It is what it is. Tennessee is still in our sights and we will somehow hang that pelt on our wall in the coming days. Once in the mountains of North Carolina, we are using the switchbacks to climb above the French Broad River. With our sweatshirts tied around our waists, we are down to our tee shirts and shorts; we talk very little in such steep assents. Hiking among the thick North Carolina rhododendrons, we are in leafy heaven. A double white blaze means a turn in the trail. One of the last white blazes we see. With Hannah in the lead, the trail seems obvious and well-traveled; though we no longer notice white blazes to guide us. Just days ago on the AT in Pennsylvania, we had white blazes every 100 to 200 yards for guidance and reassurance. But here after 15 minutes, Hannah turns to me with a “this is odd” expression and says, I haven’t seen a white blaze in quite a while. Backtracking to the last white blaze we saw, we see no evidence that we have missed the correct trail, and now we are just pissed. Really? You can’t mark the trail this close to town? Bummed, our annoyance rising, we think, If you can’t mark the trail well enough, we are just not going to hike you anymore. So there. We know this is childish and petulant; so be it. We are what we are. Determined to carry a grudge and show the trail how really p.o.-ed we are, we turn to town and disparage the trail so it can hear us; we just don’t look at it as we harrumph our way out of the woods. We want no part of its empty apologies. Through town and to the south, the AT climbs 51 stone steps into the forest. As with the north side of town trail, this is a relentless climb on this warm day. It is Carolina at its finest. Down to our tee shirts, which are soon soaked with sweat, we are getting the work out we wanted when we awoke twelve hours ago in Richmond. The trail is rocky as we have come to expect from the AT. Though the forecast has gone back and forth between rain and no rain, today is picture perfect. We do see more white blazes, and are coming down off our high horses. Back through town before 5P so Hannah can buy post cards at the Bluff Mountain Outfitters, we have notched AT State #12 in North Carolina. Now Tennessee! Nearly 1000 miles from our home in Maine, we are not going to miss this opportunity to hike in the Volunteer State when we are this close! Come hell or high water or the rain that is predicted we will hike in Tennessee. Touching down at Reagan Airport at 8A on a mid-May Thursday, we will not be picked up as we often are since both our daughter Molly and her hubby Tip are working. 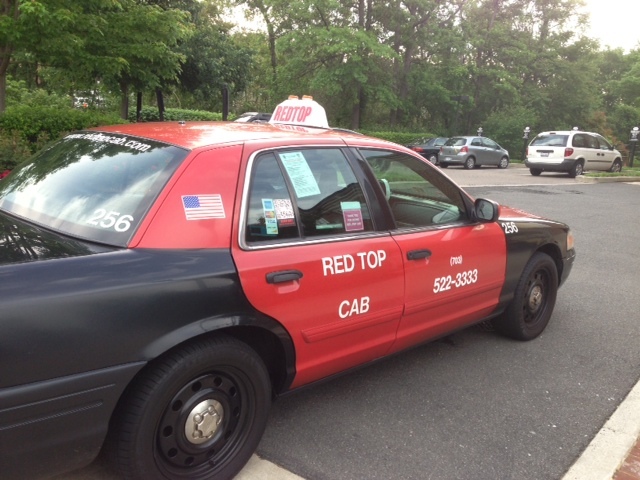 We have no choice but to call for a Red Top cab. Hold the presses! Sixty-five years old and we two have never been in a cab. As we slip into the back seat, we come face to face with a video screen showing us exactly what the charges will be, and that they can all be paid with our Visa card. 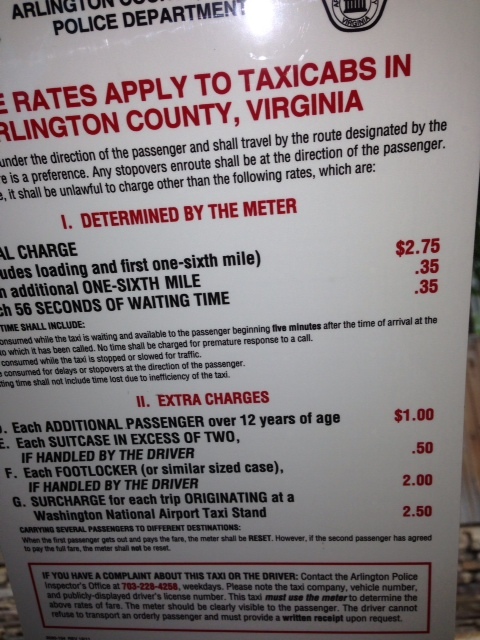 We can see how every sixth of mile, the fare increases 35 cents. In the final screen, there is even a place to include the percentage tip, 15, 20 or 25. Dan and Hannah go big time and give the driver 20% for our 3.6 mile ride from the airport. Amazingly, we are in Molly and Tip’s apartment at 830A and have a full day in the Washington, DC metro area ahead of us. Though I am a road trip kind of guy, I do love to fly. If we had driven from Maine today, at this moment we’d be stuck in some Merritt Parkway traffic in Connecticut with Big Bad New York City, the New Jersey Turnpike, the tunnels of Baltimore, and the dreaded Washington DC beltway ahead of us. 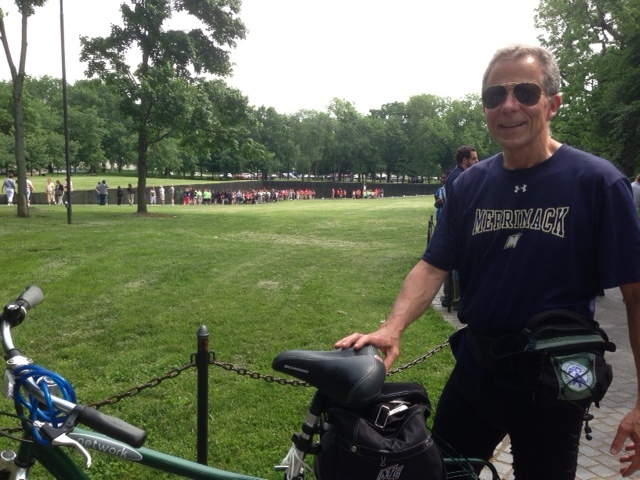 By 930A we are on bikes riding along the Potomac River to the National Mall in Washington just seven miles away. 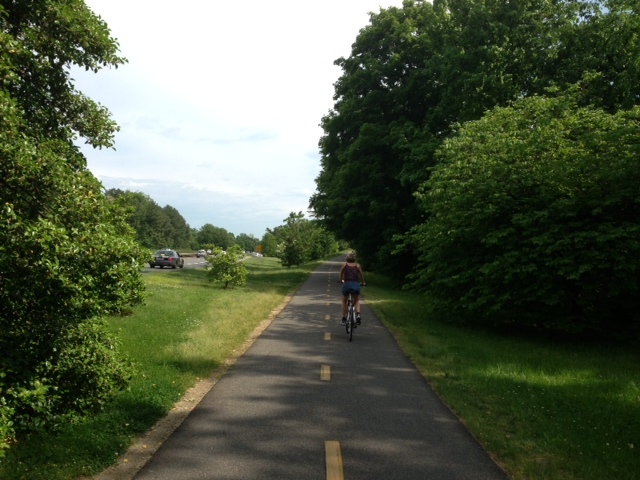 On this Thursday midmorning we have easy biking on the meandering riverside trails. 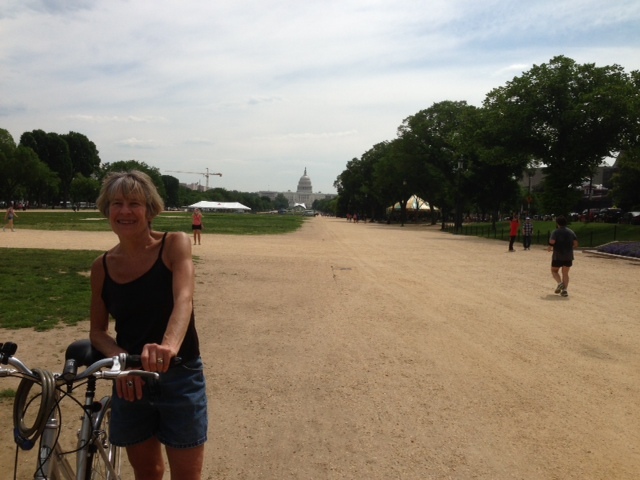 Across the Memorial Bridge with the Lincoln Memorial in the foreground we have the biking trails as our oyster. Fun fact: Today there are no direct descendants of Abraham Lincoln. Close by is the World War II Memorial. Thank you Mom and Dad for your service and to all members of the Best Generation. Most veterans are near 90 since the war ended some 68 years ago. 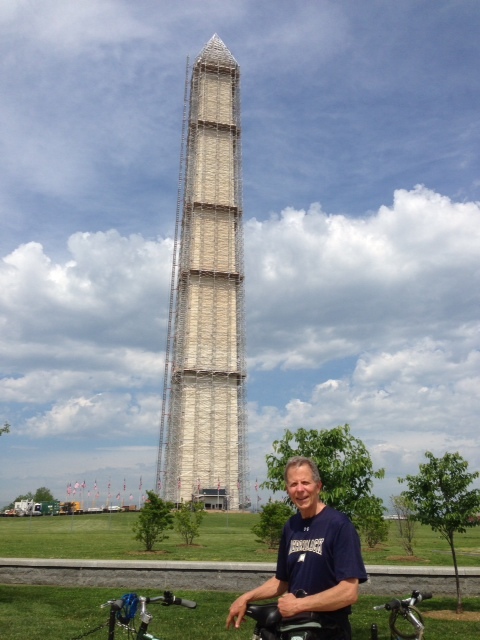 Scaffolding surrounds the Washington Monument, which is now off limits to the public after the earthquake in August of 2011. It is estimated that approximately one-third of the U.S. population felt the earthquake, more than any earthquake in U.S. history. 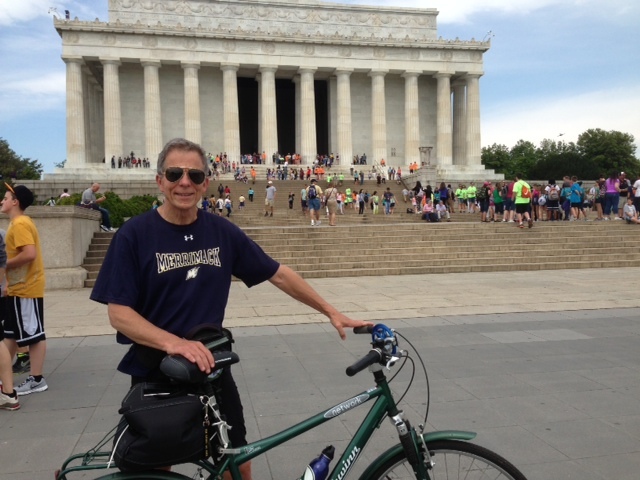 Veering off the National Mall, we come to the Jefferson Memorial on the Tidal Basin. 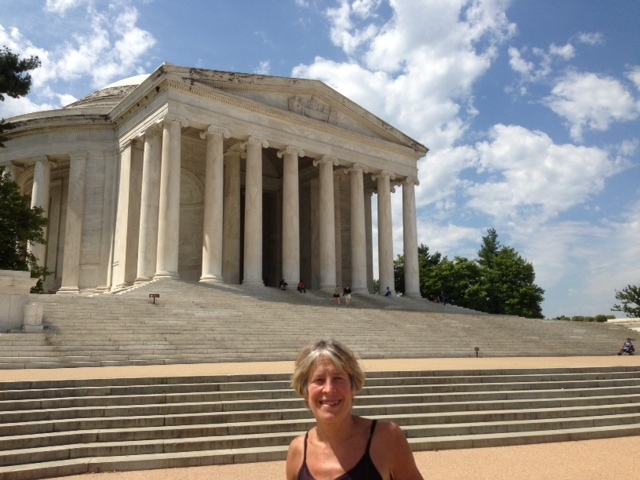 The memorial was dedicated in 1943 on the 200th anniversary of Jefferson’s birth. 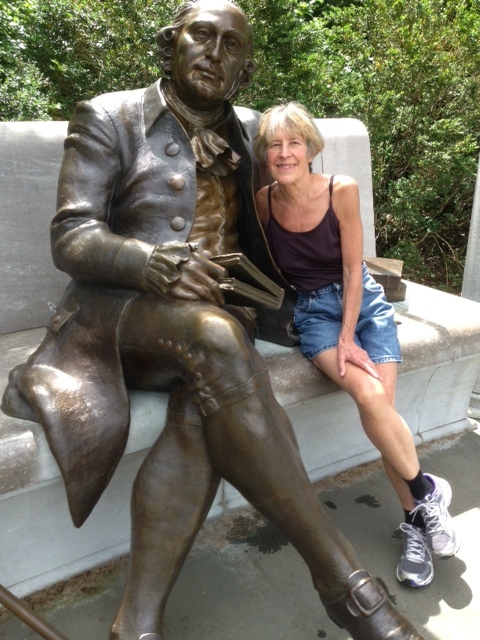 And then it’s the George Mason Memorial.In two days Molly graduates in from George Mason University. He was a mentor of George Washington and quite the ladies man as you can see. 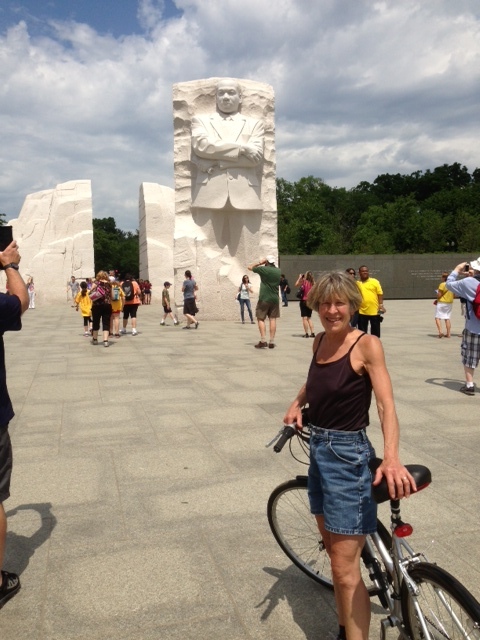 We never get enough of the architectural brilliance of the Martin Luther King Memorial with its visual metaphor of Out of the Mountain of Despair, a Stone of Hope. One of the 14 Martin Luther King, jr. panels highlights his words, Darkness cannot drive out darkness, only light can do that. Hate cannot drive out hate, only love can do that. All this majesty at our finger tips. But we are not alone. 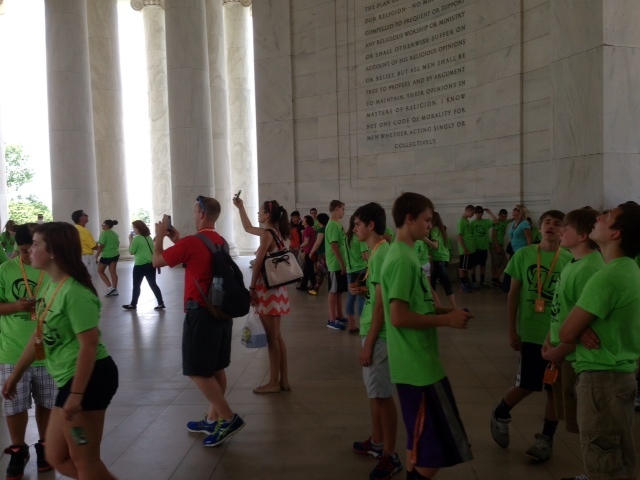 Hundreds and hundreds of middle schoolers in matching fluorescent orange or green or cardinal red shirts are visiting Washington, too. They are everywhere. Going off in random directions, flirting, bored, and often tired of walking. As a former middle school teacher who took kids on field trips, I rarely remember having any follow up activities based on the field trip. For this, I am not proud. Today I wonder what is the purpose of bringing kids to Washington. Tradition? Appreciation of America’s past? Making history tangible? Appreciation of being an American? Likely, maybe, maybe, and unlikely. And if those are some of the reasons, how then do the teachers know that students have achieved those goals? How do teachers know that their students were successful? Projects? Presentations? Papers? Tests? It’s May. Really? Call me a fool, but I’d like to think a few schools determine what learning went on when they return from Washington. 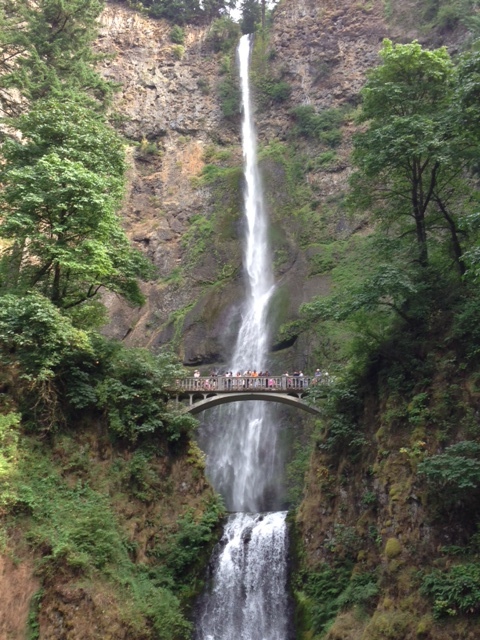 Or is it just a nice time of year to get away, when students and teachers of the Northeast are weary of each other after nine months of the classroom’s four walls? Is it just to give the parents of middle schoolers a three day break from dealing with the drama and hormones of teenagers? If so, let’s be honest and admit it. We see the teachers reminding, cajoling, rule explaining, and directing. (Interestingly, we never saw one kid texting.) It’s got to be exhausting for everyone. We wonder if they possibly pay middle school teachers enough for what lies ahead tonight back at the motel! It’s true. There’s a trust among good friends that goes beyond the rational, the need to explain. There’s a faith and a belief that your instincts are worthy of their trust. No questions, no “have you considered?” Just faith. But let me back track a little. Hannah is a letter writer extraordinaire. A morning for her is not complete without a birthday note, postcard, or some writing to connect with family or friends (and we all know that friends are family you choose). 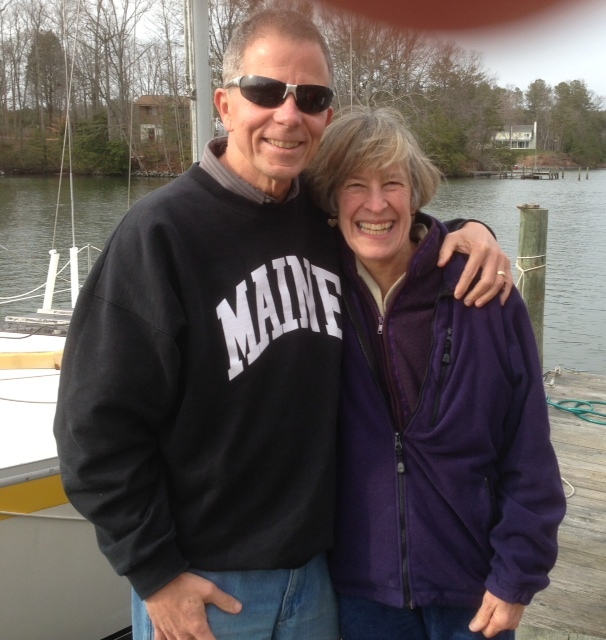 Over the forty years of our marriage, she keeps friendships alive when distances keep us, well, at a distance. One such couple is Sue and Rick, whose kids Hannah taught to swim in her hometown of Fairport, New York one hundred years ago. 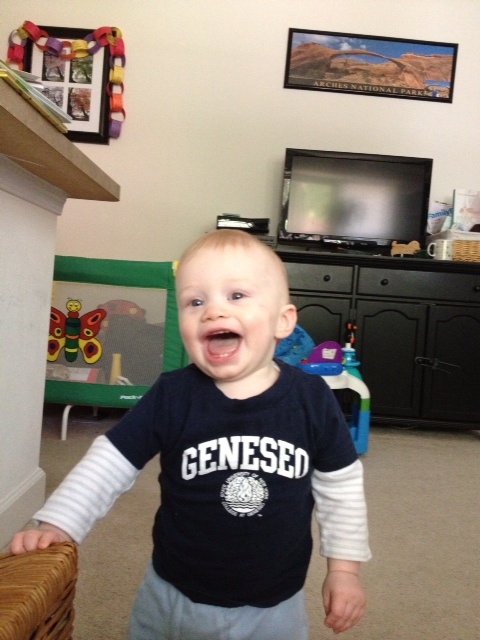 After a mid-March weekend grandparenting Owen in Arlington, VA, we drive 135 miles southeast to the Northern Neck. I had heard about the Northern Neck from my college roommate, Big Steve; but it was all kind of foggy where the it actually was. Situated between the Potomac and Rappahannock Rivers off the Chesapeake Bay in eastern Virginia, the Northern Neck was home to John Smith in the early 17th century. It’s the birthplace of Presidents George Washington, James Madison, and James Monroe as well Confederate General Robert E. Lee. Lock stock and barrel, Sue and Rick, born-Yankees, have retired to a home on a creek in a wildlife setting in the rural south. Within fifteen minutes of us all being together, we get the feeling that there is no place else they would rather be than with us. They’ve no distractions, no need to check their smart phones. As it turns out, Big Steve’s Mom, who is affectionately known as Gram to one and all, still lives in the area. Learning that she lives thirty-five minutes away, I decide that I just want to see her place and see if she is in. Now here’s where the faith and trust of Sue and Rick kick in. You see, I just don’t want to call ahead to see if she is home; even so, they immediately are on board and volunteer to drive us to Gram’s. I think, If we call, she may feel she has to “clean up” her place or prepare a snack or worry about our arrival in some way or we would be expected to stay a longer time to make the trip “worthwhile.” I know it could be an hour plus wild goose chase, but I still just don’t want to call. Just a gut feeling for me. As Ralph Waldo Emerson says, Trust your instinct to the end, though you can render no reason. And no one can forget what Kim Basinger believes, I feel there are two people inside of me – me and my intuition. If I go against her, she’ll screw me every time, and if I follow her, we get along quite nicely. I just want to do the Seinfeld “pop in.” If we call, it becomes a big deal. If we pop in, it’s spontaneous and brief. Up for an adventure, Sue and Rick take us on winding back roads of Lancaster County where we see fields of green, southern pine forests, and churches galore, many times Baptist, including the evocatively named Queen Esther Baptist Church. Pulling down the driveway at Gram’s, we see no car in the driveway. There is a garage where the car could be, but I’m not sure that Gram drives anyway. While the others sit in the car, I get out and knock on the front door, and wait. Nothing. From the front steps, I then call her on my cell phone in case she’s busy within and doesn’t hear my knock. I only get the answering machine and leave a message. 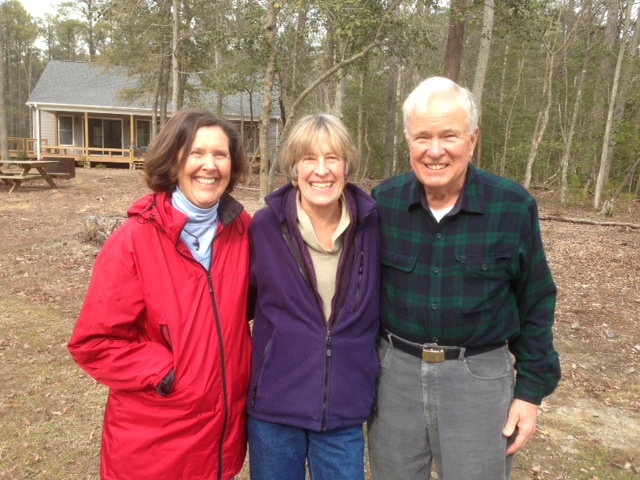 It’s a delightful spring day in the Northern Neck, an area that gets very little snow; certainly by Maine standards. 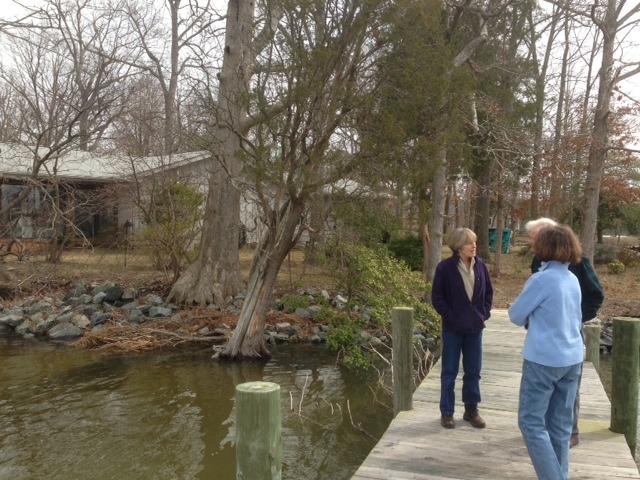 Hoping Gram will just show up in the next few minutes, we walk her property, which includes a dock on this tidal river to the Chesapeake Bay. But no Gram. We knock on the doors of neighbors to the right and left, but they, like Gram, are not home. We check out the azaleas, hollies, and daffodils – hoping our dawdling will give her just enough time to come home. But still no Gram. Sue and Rick join me in having no regrets for having driven out and Gram not being there. We all took a shot and it didn’t come through as we had hoped. By definition adventure has uncertainty. They get that finding Gram really wasn’t the goal; oh, it would have been very nice. The goal was time together letting our relationship grow a little bit more. Dear Readers, I wish you all marriages like Sue and Rick’s. Married some fifty years, they still show their affection and love for each other. It’s the look you see when the other is talking. They pay attention and still care what each other has to say. They can laugh at their own foibles without being defensive (one is a pokey driver, the other likes to come in under what the GPS says is the arrival time). They have made a community in their new home of fourteen years by focusing on relationships and welcoming people into their lives. They were not worried about chaos and disrupting their lives when for eight years they welcomed foreign exchange students into their home when their kids were of school age. 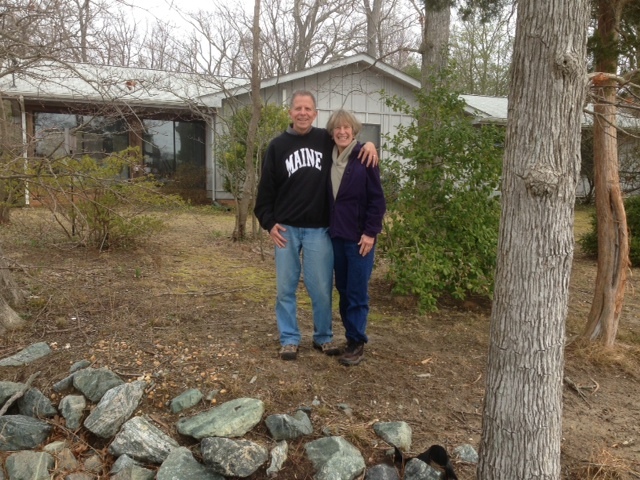 Sue and Rick have found a place on the water that is a hurricane hole (i.e., protected from the big storms). They, like us all, have storms in their lives. But they weather both the figurative and literal storms by focusing on relationships; being in the now with their family and friends. In one short day, we feel like family. Sue is a fabulous cook and Rick has problem solved to make their home most inviting. We slept wonderfully in a comfortable bed. But it’s their genuine interest in us and sharing of themselves that make ours a relationship that will grow. How do I know? I just have a gut instinct.